NEW DELHI, India — Since its creation in 2002, the Global Fund to Fight AIDS, Tuberculosis and Malaria has been an extraordinarily successful financing instrument in global health. It says it has saved 27 million lives as of the end of 2017 and reduced the number of deaths caused by AIDS, TB and malaria each year by one-third since 2002 in the countries where it invests. Now the Global Fund director has some ideas to increase funding to carry on the fight. 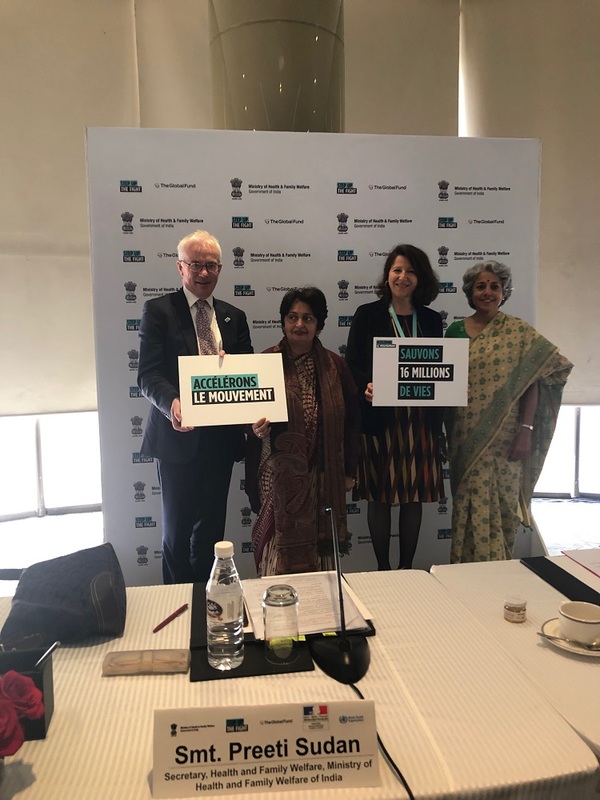 Peter Sands, Executive Director of the Global Fund; Preeti Sudan, Secretary, Health and Family Welfare, Ministry of Health and Family Welfare, India; Agnès Buzyn, French Minister of Solidarity and Health; and Soumya Swaminathan, Deputy Director-General for Programs at the World Health Organization, in New Delhi. All this has been possible because a diverse range of partners – from national governments, bilateral partners, multilateral and technical agencies, to private sector companies, foundations, civil society groups, and people affected by the diseases – chipped in collectively. However, resources remain a key challenge. On 7-8 February, India, a country which is both an implementing partner and a donor to the Global Fund, kickstarted the discussion on funds by hosting a high-level preparatory meeting of the Global Fund’s Sixth Replenishment in New Delhi, its capital city. “After years of remarkable progress in the fight against HIV, TB and malaria, new threats have pushed us off track. Right now, we are not on trajectory to reach the Sustainable Development Goal (SDG) target of ending the epidemics by 2030. Wavering political commitment, shortfalls in funding and increasing insecticide and drug resistance have slowed progress and enabled the diseases to gain ground,” says the Global Fund’s Sixth Replenishment Investment Case, presented in New Delhi. Peter Sands, executive director of the Global Fund, explained the importance of holding the preparatory conference in India to Health Policy Watch while interacting with the media on the sidelines of the high-level meet in Delhi. “India is one country that has significantly stepped up resource commitment across all three diseases, particularly TB. Global Fund is working very closely with the Indian government on TB and we are investing more money on fighting TB in India than anywhere else in the world. One reason why we are having the preparatory meeting here is because India is stepping up to the challenge and is working in close partnership with The Global Fund,” Sands told Health Policy Watch. The Global Fund needs to raise at least US$ 14 billion to meet its twin goals – to help get the world back on track to end HIV, TB and malaria, and to accelerate progress towards the UN’s Sustainable Development Goal 3 (ensure healthy lives and promote wellbeing for all, at all ages) and universal health coverage. Increasing contributions to raise that amount for the coming three-year period will help save 16 million lives, cut the mortality rate from HIV, TB and malaria in half, and build stronger health systems by 2023, according to The Global Fund. How Does the Global Fund Plan to Raise US$14B? 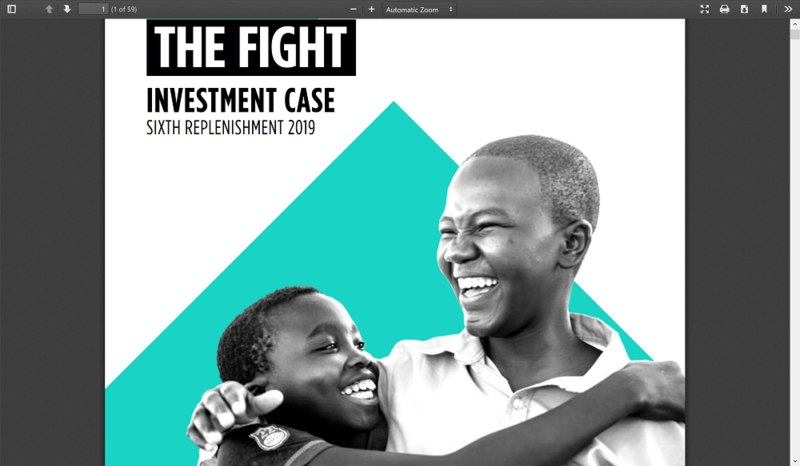 The Global Fund’s Sixth Replenishment target of at least US$14 billion represents an increase of US$1.8 billion, or 15 percent, over the US$12.2 billion raised during the Fifth Replenishment period from 2016-2018. “To achieve that increase, we actually require all of existing donors, existing small donors, new donors, the private sector. So we are in active dialogue with the full range of existing donors, new donors, potential donors and the private sector. Indeed, at the World Economic Forum meeting in Davos [Switzerland, in January], we issued a challenge to the private sector to mobilize at least a US$ 1 billion out of the US$ 14 billion,” Sands told Health Policy Watch. The Global Fund raises funds in multiyear cycles known as ‘replenishments.’ From the start till now, the private sector has contributed over US$2.7 billion to the Global Fund. India is the first country that implements the Global Fund’s programs to host such a replenishment meet. India donated US $20 million to the Global Fund in the last replenishment conference in 2016. Top dignitaries from the Indian government who spoke at last week’s high-powered meeting in Delhi included India’s Minister for Health and Family Welfare Jagat Prakash Nadda and Indian Minister of Finance and Corporate Affairs Piyush Goyal. “The Government of India and the Global Fund partnership has been a unique one, with India receiving and making financial and concurrent technical support from donors and partners since 2002,” said Nadda. He praised the Global Fund’s support in tackling all three diseases in India. India accounts for a little more than a quarter of the global burden of TB and has the largest number of multidrug-resistant TB (MDR-TB) cases worldwide, according to the World Health Organization but India has also taken steps to tackle the problem and set the ambitious goal of ending TB by 2025, five years ahead of the targets set in the Sustainable Development Goals. Luxembourg was the first country to commit to the Global Fund’s Sixth Replenishment fundraising drive. Luxembourg Ambassador to India Jean-Claude Kugener said his country was making a pledge of EUR 9 million as part of its commitment to the Global Fund. Since then, other countries such as Ireland have started pitching in with pledges. Most of the Global Fund’s money comes from donor countries. In the last funding round in 2016, the United States led the donations with $4.3 billion. France and the United Kingdom are among other top donors. New donors to the Fund include Qatar and African countries. Qatar gave US$ 10 million to the Global Fund during the 5th Replenishment Conference at Montreal, Canada. African countries that have traditionally been recipients have also increased their investments in the Fund in recent years and are emerging as global health partners. African countries that contributed to the Global Fund’s Fifth Replenishment included Benin, Côte d’Ivoire, Kenya, Namibia, Nigeria, Senegal, South Africa, Togo, and Zimbabwe. France, which took over the presidency of the G7 in 2019, will host the Global Fund’s Sixth Replenishment Conference in Lyon on 10 October 2019. The conference is aimed at raising funds to fight the diseases and build stronger systems for health for the next three years. France is emerging as a key player in global health. It is the second-largest contributor to the Global Fund, the largest contributor to drug pricing mechanism Unitaid and the sixth-largest contributor to Gavi, the Vaccine Alliance. “In October, for the first time in France, we will host the Global Fund’s Replenishment Conference in Lyon. We are calling on all stakeholders to mobilize to make this conference a success,” said French Minister of Solidarity and Health Agnès Buzyn, who was in Delhi for the Preparatory Meeting of the Global Fund’s Sixth Replenishment. “Strengthening primary health care and all the social determinants of healthcare will be among our key priorities. We hope to focus on this in France and all over the world,” Buzyn told Health Policy Watch. One promising development flagged by many speakers at the Delhi meet is increasing financial commitments by national governments. “All countries are stepping up domestic financing. Ultimately, sustainable victory against these diseases and sustainable development of health systems is going to be done by governments,” Sands told Health Policy Watch. The World Health Organization also highlighted its partnership with the Global Fund. Image Credits: Global Fund, Patralekha Chatterjee.